Here's a promo coupon I got to paint, probably for some early 90's LucasArts Adventurer edition. It's actually amazing how much of this kind of stuff I was trusted to do with little or no content notes from above, which made it tons o' fun. I'll see if I can track down my activity pages with the art lesson and the Guybrush paper dolls. 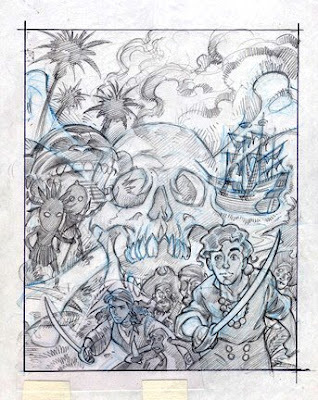 I have a buy off on my rough for Telltale Games "Tales of Monkey Island" cover. Still too early to post any of it as I'm in early stages of the illustration. In the meantime, here's part of my tiny contribution to Curse of Monkey Island. I believe Larry Ahern and John Ackley pitched me their idea of a LeChuck with a flaming beard so I was thinking his skull could be silhouetted in the fire. I think my Elaine is a variation on a design Larry had done, but I do sort of like something about my slender version of the Voodoo Queen. I have a rough sketch for the Tales of Monkey Island pre-order cover in the pipe waiting for final approval. I'll post it at some point soon. 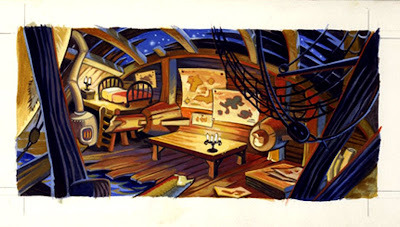 In the meantime, here's a color test done for Monkey Island 2 LeChuck's Revenge probably painted in 1990. In this game we had the luxury of being able to draw backgrounds on paper and scan them giving us a greater range. This was my first background test of a cartographer's cabin painted in gouache. Peter Chan was a fiend with color markers and we ended up doing a lot of the backgrounds in marker as it was much quicker than painting. So I've been invited by Telltale Games to create an illustration for their Special Pre-Order edition of Tales of Monkey Island, a five episode series of adventure games coming this summer from Telltale. It's fun to get a chance to reconnect with Monkey Island since it was one of my first jobs at LucasArts, and I was fortunate to contribute artwork to various Monkey Island projects several times throughout the years. I'm sketching the concept right now and I will plan to document the progress in stages. I'll have to wait until we are closer to the official unveiling of the cover to let you know what I'm up to but in the meantime I'll post some ancient concept art from the original games. Here's the sketch for my first Monkey Island cover done in 1990.